All Christian ministers of the gospel, especially those who are just entering the Christian ministry, need the counsel and encouragement of their fellow ministers. Older ministers, who have gained a wealth of knowledge through many years of painful and costly experience, are eminently qualified and are duty-bound to share their God-given, experience-acquired, knowledge with their needy brethren. 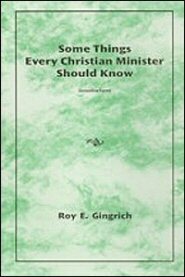 Brother Roy Gingrich, a long-time minister of the gospel, feels this obligation resting upon him and to fulfill this obligation, he gives us this book, passing on to us some things that he has learned through many years of prayer, study, and experience. This book is simple and uncomplicated, but it contains in condensed form a wealth of knowledge that every Christian minister should know.